"Only 3 ingredients! Can decorate with chocolate jimmies or colored sprinkles if done immediately after dipping." In a large mixing bowl, combine crushed cookies and cream cheese to form a stiff dough. Roll into balls and dip with a fork in melted candy coating. Let rest on waxed paper until set. 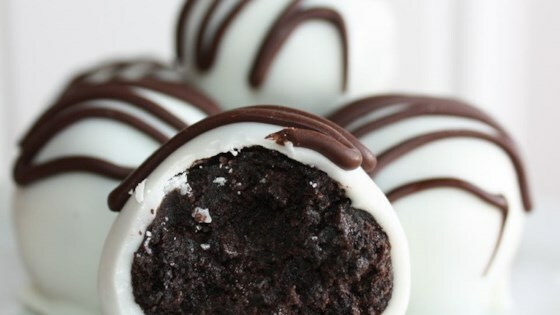 See the trick to making incredibly easy cookie balls. These are Awesome. Change it up a litle by using chocolate almond bark (candy coating) and mint flavored cookies. Great for holiday parties! !